After a five-year hiatus, Banksy is back in NYC! Our expert team of art handlers specializing in fine art moving in New York was very happy to receive a request to check out one of the latest Banksy murals in Midwood, Brooklyn in order to find the best way to extricate the artwork from the semi-derelict building. It was an amazing experience for Fine Art Shippers for two reasons. First of all, we love challenges as our expertise is not limited to only fine art shipping in NYC and worldwide; we are also proficient in setting up gallery exhibitions and art installations of any media and size. 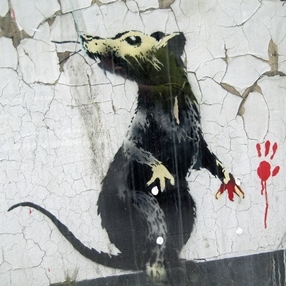 Secondly, we are passionate about art, and we do love striking stencil art by Banksy. As you know, Banksy is an elusive street artist with a mysterious identity. He is not represented by any gallery or institution, as well as he does not receive money for any of his works. However, the truth is that Banksy art is expensive. In fact, his fantastic murals are sold at millions of dollars at auctions around the world. But street art is free, right? So how can this be possible? Since fine art moving in New York is our specialty, this question is no less important to us than it is to Banksy fans. Being engaged in fine art moving in New York for 20+ years, we know that gallery exhibitions and auction sales make contemporary artists famous and successful. Banksy is not an exception. The mystery around his personality and six-figure prices for his works have made Banksy a living legend, even though the artist does not appreciate the commercialism of his art. However, it is still one of the factors making him so popular today. Another important fact is that while street art is free, every artwork that appears on someone’s property without the consent of the owner belongs to the owner and not to the artist. So there is nothing surprising about the fact that people sell Banksy murals, which makes the artist even more popular and his works even more sought-after. In this way, to sell or not to sell Banksy art is like a moral dilemma for every lucky owner of the artist’s mural. You can sell it for millions of dollars, support the artist and leave it free for public view, or preserve it as a perfect example of contemporary street art for future generations. It’s up to you what to choose! Anyway, if at any point you need help with fine art moving in New York, Fine Art Shippers is always at your disposal!